Happily reunited: Jonathan Franzen and his glasses. 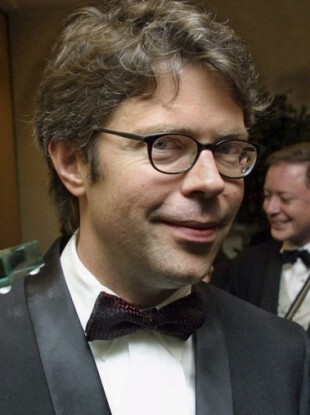 IT HASN’T BEEN a good couple of weeks for author Jonathan Franzen. First he had to face the trauma of seeing 80,000 copies of his acclaimed new novel, Freedom, sent to the shredding machine, after it emerged that printing errors had made it into the UK edition. Then someone steals his specs at his own book party and hands him a £100,000 ransom note. The BBC reports that the audacious heist, which happened on Monday evening in London, took a Bond-like twist, when the assailant tried to escape by jumping into the Serpentine Lake and a police helicopter was dispatched to apprehend him. Around 8pm, two men, claiming to work for Puffin, gatecrashed the party at the Serpentine Gallery and approached Franzen. One snatched his glasses and escaped, before the other handed the stunned author a ransom note and also fled into Kensington Gardens. The note read: “$100,000 – Your glasses are yours again!” and left a Hotmail address. Poor Jonathan Franzen. A man just ran up to him, pulled the glasses off his face, and legged it out of the room… At his own party! Franzen tried to give chase, but the man had disappeared. Somebody shouted, ‘Channel 4, Channel 4,’ and grabbed the glasses from my face, and took off running, and I actually thought, because I was suddenly blind, I thought it was my editor, warning me that Channel 4, from the BBC, had arrived. So, I trotted after this person, and knew something was amiss only when I saw him leap a five-foot fence and disappear into the trees. Franzen is a notoriously fastidious writer who eschewed Oprah and spent nearly a decade in a soundproofed room to write Freedom. After the events of the last few days, he might be quite keen to get back there. Email “"Dear Mr Franzen. We've got your glasses. They're refusing to talk."”. Feedback on “"Dear Mr Franzen. We've got your glasses. They're refusing to talk. "”.